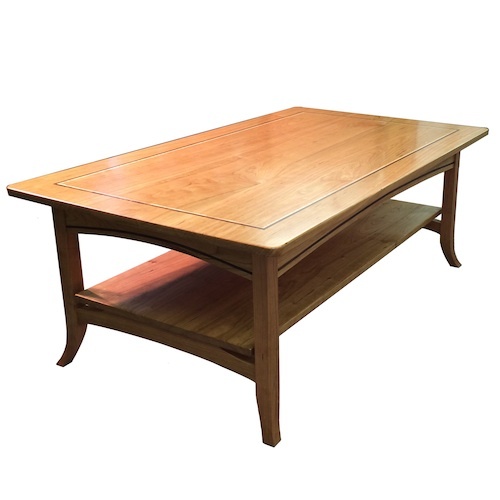 The Seckel Inlay Coffee Table has a double set of inlays of Tiger Maple and Walnut on a Cherry top. The piece has flared french style legs and a shelf. The side skirts have a Walnut inlay detail. The finish is a blend of natural oils. The top is finished with additional coats of urethane for a harder more protective surface. The entire piece is top coated with beeswax. Click on the image to see additional photos. Other sizes can be designed to meet your specific needs.